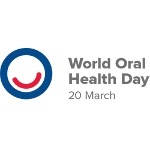 World Oral Health Day is an annual awareness day observed on March 20. Its main goal is to raise global awareness of the importance of oral health and oral hygiene. World Oral Health Day was launched in 2013 by FDI World Dental Federation (Fédération dentaire internationale), an international NGO representing the dental profession. Based in Geneva, Switzerland, it comprises over 200 national member association in about 130 countries. FDI is the world’s leading organization representing more than a million dentists worldwide. One of FDI’s key goals is to encourage governments, health associations and general public across the world to work together to promote oral health. According to statistics, 90% of the world’s population will suffer from oral diseases in their lifetime. Proper oral hygiene could help prevent many of them. World Oral Health Day launches a year-long campaign to raise global awareness of prevention of oral diseases. On the occasion of World Oral Health Day, FDI and its member associations organize a series of awareness events and activities. One of them is the annual Dental Students Competition, co-organized with the International Association of Dental Students (IADS).